Beating its own annual record, the Kemptville District Hospital (KDH) Auxiliary donated $70,000 to the Hospital in the lead-up to National Volunteer Week, celebrated April 7 to 13, 2019. The funds will be used primarily to purchase two new ‘smart beds’, which can monitor a patient’s health while they sleep and alert a healthcare provider to potential problems. 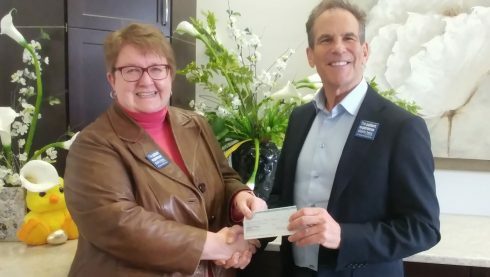 On behalf of the KDH Auxiliary, Brenda Steacy, Auxiliary President, presents a $70,000 cheque to Frank Vassallo, KDH CEO. While he gratefully acknowledged the significant financial contributions of the KDH Auxiliary over the years, now totaling a staggering $1.43 Million, the Hospital’s Chief Executive Officer, Frank J. Vassallo, underlined the impact of the volunteers’ contributions of that most precious commodity – their time. According to Brenda Steacy, President of the KDH Auxiliary, its members contributed a grand total of 13,508 volunteer hours in 2018. “This is the highest number of hours in the recorded history of the Auxiliary,” she said. “This includes direct hours by the many volunteers in the hospital, as well as behind the scenes hours,” she explained, noting that behind the scenes hours include committee work, managing, buying and organizing for the gift shop and coffee bar, seasonal decorating, financial management, and training and coordination of volunteers. Steacy also shared that the new contribution of $70,000 was $5,000 more than the last four annual donations. She attributed this increase to the very successful ‘Bridal High Tea’ held in September 2018. To recognize its volunteers during National Volunteer Week, KDH will hold its annual Volunteer Appreciation Tea on April 11, 2019 from 1:00 to 3:00 pm at the North Grenville Municipal Centre. Entertainment will be provided by students from North Grenville District High School, performing several numbers from Disney’s ‘Beauty and the Beast’. This year’s Volunteer Appreciation Tea is particularly significant as 2019 marks the 60th Anniversary of the Auxiliary’s founding in 1959, more than a year before the hospital opened its doors on June 29, 1960. The Auxiliary was formed after Miss Margaret Storey, RN, chair of “Women’s Activities” on the Board, called all interested area women to meet in Kemptville’s Leslie Hall for the purpose of forming a Women’s Auxiliary for the proposed hospital. Her appeal drew an overwhelming response; in a few months, the membership stood at 751. The Auxiliary’s duty at this time was to raise funds to provide bed linens, towels, drapes and curtains, along with other small needs. After the hospital opened, they would be responsible for repair and replacement of these items.